We share here the responses from three historians to a critical review of the life and legacy of historian Howard Zinn in the March 25 issue of The New Republic. This is the second major critique of Zinn and A People’s History of the United States in recent months. 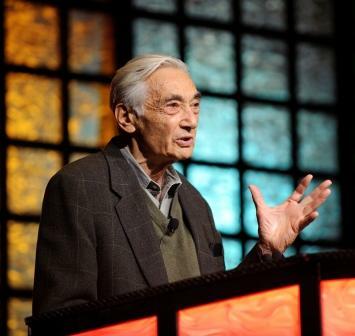 The American Federation of Teachers’ (AFT) published “Undue Certainty: Where Howard Zinn’s A People’s History Falls Short” by Sam Wineburg in the Winter 2012-2013 issue of American Educator. That article received an outpouring of responses from AFT members and the History News Network (HNN) published a response by Robert Cohen called “When Assessing Zinn, Listen to the Voices of Teachers and Students.” Another response to The New Republic article, “David Greenberg Doesn’t Hate Howard Zinn Because He Was a Bad Scholar, but Because He Was a Radical” by Clement Lime, was published in Tropics of Meta. We welcome your comments on either article. You can add a comment below or send an email to the Zinn Education Project. What follows are critical responses submitted to The New Republic by myself [Jesse Lemisch], Staughton Lynd, and Robert Cohen. Lynd and I, New Left Historians, were leading participants in the 1969 Radical Caucus, and the caucus ran Lynd for president of the association. At that same tumultuous 1969 meeting, I presented the paper which was later published as “On Active Service in War and Peace: Politics and Ideology in the American Historical Profession” (Toronto, 1975). Cohen (NYU) is author of a biography of Mario Savio and other books, and published the article “When Assessing Zinn, Listen to the Voices of Teachers and Students,” on History News Network, January 7, 2013. Cohen is editing, for publication, Zinn’s 1963 Spelman College diary. The New Republic was slow to put Greenberg’s diatribe on its website. It finally appeared in this form on March 19, some time after subscribers had received the hard copy. But word had gotten around and there were rumblings among historians. The cyberworld being what it is, some of this got back to Greenberg, who silently corrected one or two errors that are in the hard copy but that mysteriously vanished from the web version. This is a new and somewhat Orwellian feature of publication: which is the real New Republic, the one on the web, or the hard copy? (Compare with the New York Times, which follows the emerging convention in specifying on the web copy corrections that have been made). Nonetheless, our critique addresses issues raised by Greenberg should be part of the ongoing discussion. David Greenberg is confused and, finally, just plain wrong, about what happened at the 1969 meeting of the American Historical Association (AHA) when he writes: “Jesse Lemisch, a leading activist, ran for association president on an insurgent ticket” [“Agit-Prof,” The New Republic, March 25, 2013] In fact, contrary to Greenberg, I did not run for any office. We members of the AHA Radical Caucus nominated historian Staughton Lynd for president of the association as a protest against many things, including Soviet-style elections of AHA officers without opposition. And, unhappy with the governance of the Association, we were also deeply opposed to the war in Vietnam. (Lynd had been evicted from his position in the Yale History Department for having done his Quaker duty on a dangerous peacemaking trip to Hanoi.) I’m proud to be confused with Lynd. The meeting was, as Greenberg states more correctly, “a donnybrook.” One of the tumultuous business meeting’s features was a frothing rant against Lynd and the rest of us by Eugene Genovese, who shouted from the floor, to thunderous applause from the Right, “we must put them down, put them down hard, once and for all” (For an account, see Lemisch, “Radicals, Marxists and Gentlemen,” in the Radical Historians Newsletter, November 1989). Genovese had earlier made a reputation in the pages of the New York Review of Books as the Marxist who could be depended on to attack the Left. One result of all this was a kind of a democratic revolution in the governance of the AHA, after a post-election Pacification Tour by the candidate who was elected president, Robert R. Palmer. If it is true that what Greenberg mistakenly calls “Lemisch’s insurrection” did “sputter,” it nonetheless had a deep impact on the AHA, as anyone who knows the organization today will immediately observe. Greenberg’s language could be applied more broadly to the various insurrections of the ‘sixties, and maybe that’s his agenda: as it happens, many of the historians who he seeks to rehabilitate (C. Vann Woodward and others) found themselves vehemently and publicly at odds with main currents of the ‘sixties and hardly divorced their history from their politics. At the time, many of us on the left were also engaged in the complex task of figuring out how to be both scholars and activists (see for instance my 1968 “Who Will Write a Left History of Art While we are All Putting our Balls on the Line?” reprinted in the Journal of American History, September 1989). Greenberg clearly sides with the anti-activist position taken by Genovese, about whom he can’t find anything more critical to say than that he was “cantankerous.” (This is the same Genovese who ended up back in the Church and admiring the Confederacy). Faced with a choice between Genovese and Lynd, anybody acquainted with the times, the war, and the way professional associations used to be run will of course side with Lynd. Jesse Lemisch did not run for president of the American Historical Association in 1969. It was I. I am unsure whether this flagrant error is an “influential mutilation of American history,” to borrow the sub-title of David Greenberg’s article on Howard Zinn. Perhaps it is only one of the errors in fact strewn throughout the article. 1. Greenberg says that at Spelman College in Atlanta, where Howard and I taught history in the early 1960s, the civil rights movement attracted “middle-class black college students.” The most celebrated of several students at Spelman during the time that we both taught there was Alice Walker, the Pulitzer Prize-winning author of The Color Purple. Her father was a sharecropper. My wife Alice and I shared a memorable Christmas meal with the Walkers at their home in Eatonton, Georgia. 2. Greenberg says that Howard’s book on SNCC [SNCC: The New Abolitionists] was “charitably described” by Martin Duberman as on-the-spot reporting “rather than a comprehensive scholarly account.” I can remember entering the Zinns’ apartment on the Spelman campus and finding Howard tape recording the experience of two SNCC organizers who had just been released from jail. I am under the impression that Howard’s’ participatory observation of SNCC activity in Albany, Georgia, and Hattiesburg and Greenwood, Mississippi, remain building blocks for more comprehensive scholarly accounts by historians like Wesley Hogan and James Marshall. Does it disqualify a narrative as history if the writer was present when history was being made? What about Ten Days That Shook The World by John Reed or Homage to Catalonia by George Orwell? 3. Howard Zinn was abruptly terminated by Spelman College the day after students left campus in June 1963. Greenberg says: “Zinn secured an offer from the government department of Boston University, and the family returned North.” No, Howard went to his faculty mailbox to check on his mail before his family, already in the loaded car, left the campus to return North. (See Zinn’s autobiography , You Can’t Be Neutral on a Moving Train, a source that Greenberg gives no indication that he has consulted, at pages 41-45.) There, his livelihood having been taken away without notice or opportunity to appeal, Howard was able to find another job. 4. Greenberg sets up a supposed contrast between “good” New Leftists like Eugene Genovese who did not let their politics influence their writing of history, and “bad” New Leftists like Howard who “sympathized with the NLF.” I was on the speakers’ platform with Genovese at a Vietnam war teach-in at Rutgers University. I heard him say that he hoped the NLF would win. I am not aware of any similar statement by Howard. In any event, Greenberg’s article does not provide such evidence. 5 . Greenberg asks us to consider whether Howard Zinn may have been a member of the Communist Party. Like Greenberg, I don’t know. I do know that one of the books that influenced Howard in his conversion from eager bombardier to passionate opponent of any conceivable modern war was Johnny Got His Gun by Dalton Trumbo, about a young man who became a soldier and then a paraplegic. In my last telephone conversation with Howard he commented bitterly that the Communist Party, by then intent on military victory, had prevented the book’s republication during World War II. 6. Greenberg says that in Howard’s discussion of the United States at mid-century labor’s “decisions to work with management to secure good wages and benefits are seen as selling out.” In what I consider a densely-documented stretch of A People’s History (1999 ed., pp. 392-402), Howard grounds his analysis on that of Frances Fox Piven and Richard Cloward in their book Poor People’s Movements. This is one stretch of United States history that I know something about and I believe that to characterize Zinn’s discussion as “lazy, conventional” history, as exhibiting a “subordination of analytical problems,” or as a reduction of “historical analysis to political opinion,” is itself lazy, conventional, hostile to analysis, and politically opinionated. There is a “pretty lousy piece of work” on display in David Greenberg’s article “Agit-Prop.” But it is not a piece of work by Howard Zinn. David Greenberg (“Agit-prof: Howard Zinn’s Influential Mutilations of American History,” New Republic, March 25, 2013 ) believes it a cardinal sin that Howard Zinn biographer Martin Duberman does not share his jaundiced view of Zinn’s A People’s History of the United States. Greenberg misses the lessons of his own past. As a high school student A People’s History left Greenberg “thrilled” with radical history. And the result? Today he is a professor of history! Nor is Greenberg unusual in this regard. Historian Eric Foner notes having “long been struck by how many excellent students of history first had their passion for the past sparked by reading Howard Zinn.” Student and teacher letters in the Zinn papers at New York University (NYU) attest that his book engaged them with a radical view of the American past that contradicted their stultifying, triumphalist textbooks. Here are comments from teachers, collected by the Zinn Education Project, about the impact Howard Zinn and A People’s History have had on their classrooms. Article. Howard Zinn interview by Barbara Miner. 1994. Rethinking Schools magazine. I started studying history with one view in mind: to look for answers to the issues and problems I saw in the world about me. By the time I went to college I had worked in a shipyard, had been in the Air Force, had been in a war. I came to history asking questions about war and peace, about wealth and poverty, about racial division. #tdih 1930: In a prison long known for unspeakable cruelty and overcrowding, 322 inmates were killed in the Ohio State Penitentiary fire. Learn more below and find resources to #teachoutsidetextbook about incarceration in history and today. Three hundred twenty-two inmates were killed in a fire at the Ohio State Penitentiary. Thousands more educators are teaching outside the textbook this Spring.